Warwick Castle is considered to be one of Britain's greatest medieval attractions. The castle is over a thousand years old and has been well maintained. The grounds of the castle are an ideal venue for a picnic. Many forms of medieval entertainment are staged at the castle throughout the year for the tourists. Warwick Castle was built on the orders of William the Conqueror in 1068 as part of a defensive chain of castles established to maintain power. The castle has been remodeled and strengthened over the years. During the Baron's War Simon de Montfort's forces attacked and damaged the defenses. The Beauchamp family took possession of the castle shortly after and owned the castle for almost 200 years. In the late fourteenth century the several major changes were made to the castle including the great hall and domestic ranges and a water gate. The castle has been an important seat of power and was the home for the Earls of Warwick who played a stellar role in shaping the history of England. Richard Neville, Earl of Warwick was known as the 'Kingmaker' for his involvement in bringing Edward IV to the throne. The castle is now owned by the Tussaud Group and is possibly the best castle to visit in Britain due to the wide range of events. A Visit to the Warwick Castle will be an unforgettable one for tourists. The towers, Fortifications, Ramparts, Great halls and Gardens that get covered by 90,000 flowers in spring, take the visitor into a medieval time wrap. 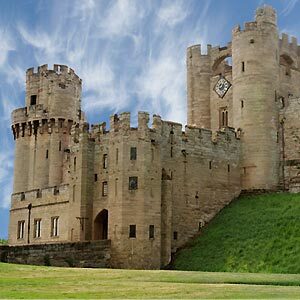 As with every medieval castles the Warwick castle too has its own share of mysteries - the Ghost tower where the murdered soul of Sir Fulke Greville is said to dwell, the eerie dungeons and the grisly torture chambers all adding up to this magical visit. The Warwick castle is open on all days except Christmas and would take a minimum of four hours for a thorough and enjoyable exploration. The cost of entry for the Warwick Castle ranges from ?7.25 for a child to ?40 for a family. The cost also varies according to the season of visit.